Need Help With Defy Stains? Free Shipping On 5 Gallon Pails: Click Here to Order Defy Wood Products! Defy Deck Stains are applied wet on wet for most scenarios. We love hearing from our customers who have used the Defy Stains or have questions on the application. We appreciate your input, so feel free to leave a comment below and pictures of your completed projects if you have them. Wet on Wet stain application consists of applying a coat of stain the applying your second coat of stain while the first coat has not dried or cured completely. This process allows the application to be evenly applied while at the same time, over application issues are minimized. So how do you apply Defy Wood and Deck Stains “Wet on Wet”? This article will explain the simple steps taken to help you apply your Defy Stains properly. Have a question on the best time to stain with Defy Wood Stains? We love hearing from our customers who have used the Defy Stains or have questions on the application. We appreciate your input, so feel free to leave a comment below and pictures of your completed projects if you have them. The best time to stain your deck is either the spring or the fall. If you stain your deck in the summer, make sure you do it out of the direct sunlight. Applying a deck stain in direct sun will cause the stain to dry too quickly and can result in premature stain failure. In the summer, stain your deck in the morning or evening so the deck surface isn’t too hot. Remember, the surface temperature of the deck can be much hotter than the air temperature. Also, make sure there’s no chance of rain so your hard work doesn’t get washed away. Proper application Tools for Defy Stains? We love hearing from our customers who have used the Defy Stains or have questions on the application. We appreciate your input, so feel free to leave a comment below and pictures of your completed projects if you have them. When it comes to staining decks, there are several tools available including sprayers, brushes, and rollers. Watch this video to find out the best deck stain tool that works the best, and will help you stain your deck with less time and effort. 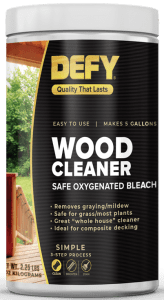 How Many Coats of Defy Deck Stain to Apply for Defy Stains? We love hearing from our customers who have used the Defy Stains or have questions on the application. We appreciate your input, so feel free to leave a comment below and pictures of your completed projects if you have them. The general rule of thumb is to apply only as much deck stain as the wood can absorb. Typically this will be 2 coats unless you are dealing with extremely dense hardwoods which may only be able to absorb 1 coat of wood stain. Watch this video to see more tips on how many coats of stain to apply. We love hearing from our customers who have used the Defy Stains or have questions. We appreciate your input, so feel free to leave a comment below and pictures of your completed projects if you have them. Moisture Content of Wood When Applying Defy Wood and Deck Stains. When applying defy deck stain it’s important to note the moisture content of the wood. If the wood you are staining is too moist it can create mold and mildew problems. If you apply stain to moist wood it can trap and seal the moisture in, which can also create rot and decay problems. To prevent this it’s important to check the moisture content of the wood whether it’s after a rainstorm or after you have washed the wood that you’re getting ready to stain. To check the moisture content of wood when applying Defy deck stain you will need a moisture meter. Once you have a moisture meter you can stick the prongs into the wood so that you can get a moisture content reading. For the best results take several readings to get an average. Take a reading on some sections of the wood that get plenty of sun exposure and also on the more shaded areas of the wood. It is these more shady areas that tend to be moist for longer periods of time. 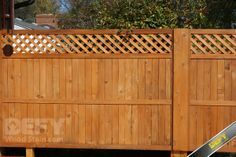 We love hearing from our customers who have used the Defy Stains or have questions on applying to a wood fence. We appreciate your input, so feel free to leave a comment below and pictures of your completed projects if you have them. Wooden fences are a great investment to increase a home’s curb appeal. They also offer privacy for families and safety for kids and pets. Wood fences can last many years if they are well maintained. To keep a wood fence looking great and standing the test of time it is crucial to protect it from the damaging effects of the elements. Regularly applying a wood fence stain like Defy will ensure you get the most out of your investment. How to Maintain for Defy Stains? We love hearing from our customers who have used the Defy Stains or have questions. We appreciate your input, so feel free to leave a comment below and pictures of your completed projects if you have them. With any type of wood stain, maintenance is essential for continuing, lasting results. All wood stains will eventually begin to fade as graying occurs. With Defy Wood Stain’s VOC compliant formula maintenance is easier, less time consuming and effective. To maintain wood that is stained with Defy Wood Stains occasionally clean the surface with a mild detergent and water. This will normally restore stained surfaces back to their original appearance. 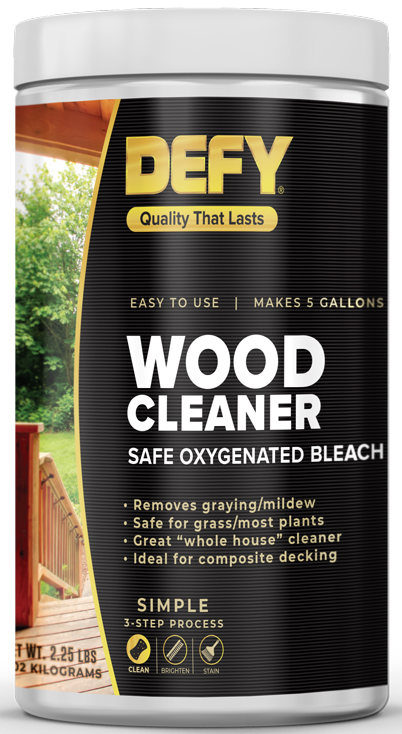 If the wood has begun to fade, a light maintenance coat of Defy Stain is recommended for maximum protection.